The LA Auto Show has released its Green Car of the Year and Green Marketing contestants. Can you guess who won? It’s hard to figure how things work sometimes. Your favorite products don’t always make it the Consumer Report totem pole and car magazines can trash your favorite cars. The Green Car of the Year 2013 award at this year's LA Auto Show included all the usual suspects, Chrysler Group LLC’s Dodge Dart Aero, Ford Motor Co.’s C-Max and Fusion, Mazda Motor Corp.’s CX-5 SkyACTIV and Toyota Motor Corp.’s Prius c. All are worthy candidates, but one thing strikes me, where are the little disruptive players? For the Green Marketing section, you guessed it Toyota, Ford, Chevy were the heavy-hitters. So who did it best? Green Cars of the Year 2013. This year’s award considered a wide range of cars with various energy sources, raging from fuel frugal gasoline engines, such as the Dodge Dart and the Mazda CX-5 to hybrids and plug-in hybrids, PHEV. Of course anything green car related and especially green marketing wouldn’t be complete without mentioning Toyota’s relentless green campaign pushing its Prius and especially new Prius C . Yet one car company we might not have associated with fuel economy in the past is Ford. 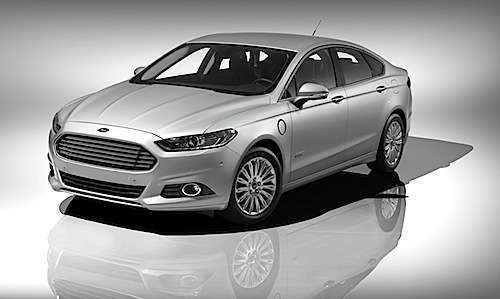 In fact, Ford’s Fusion in both its hybrid and plug-in hybrid iterations, Energy have won this years’ Green Car award. Green Marketing. When it comes to green marketing, Toyota takes the podium and indeed has won the coveted top spot here. Toyota’s marketing campaign does a good job at conveying this do-good-green-feeling with its Prius ads and commercials. Choosing Green Winners. This is where things get a little murky. In this day and age on always on, busy and chaotic social media driven world, online opinions are starting to take on a greater role. Anyone with online access and with working digits can tip the scale. Anyone with a modicum of taste and ideas can become the most virulent proponent or rabid hater. So who do you balance cold hard numbers with online sentiment? This is something the Nielsen Automotive group is trying to tackle as well as anyone could. Now everyone has their idea of what green is. The 2012 LA Auto Show is a good testament of that. I certainly can think of a few companies that would, if not at least win, consider merit. Most of the above-mentioned carmakers are mainstream, industrial heavy-hitters. I think a quick nudge to Tesla and CODA might have been a good thing to do. What about you, who would you give the Green Car Ward for 2013?